BUSHWICK — After 71 years, this Italian pastry shop isn't afraid of change. Two brothers, who grew up washing pots and pans in Circo's Pastry Shop, owned by their father, have kept faithful to their Italian roots while adapting to the neighborhood as it changed around them. Take the "Holy Cannoli Donut" dreamt up by Anthony Pierdipino, 31, last year. The oblong donut is sliced open and loaded with cannoli cream, sprinkled with cinnamon, powdered sugar and chips of traditional cannoli crust and it's been a smash hit among the newer donut-crazed Bushwick residents, they said. 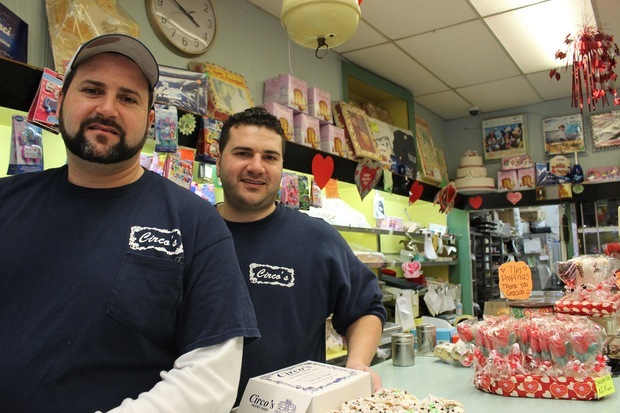 Circo's Pastry Shop, which has been in operation continuously since 1945 on the corner of Knickerbocker Avenue and Hart Street, is now owned and operated by Anthony and Salvatore Pierdipino, 36, who took over completely for their father, Nino, when he retired two years ago. The transition was an easy one since they'd been working at the shop since they were kids, the brothers said. "I don't know what Saturday morning cartoons [are]," said Salvatore. "Saturday morning cartoons [was] working here." For years the two were only allowed to do menial tasks like washing fruit, slicing strawberries or cracking eggs. "My father wouldn't let you touch anything. 'Watch me, watch me, watch me,'" Anthony remembered his father saying. "How many times can you watch someone and not want to do it?" Anthony said he was 15 when he first got to do something other than grunt work — and it was a fluke. His father was taking a nap and had left an unfinished cake on the counter. Anthony seized the opportunity. "He woke up and he saw that I'd finished the cake," Anthony said. "I did it right." Whether it was $50 or $75 that their father Nino had in his pocket when he arrived from Sicily as a teenager in the 1960s, is up for debate between the two brothers. Like his two sons, Nino had grown up working as a pastry chef in Sicily since the age of 11. When he got to the U.S. with his mother and siblings in the mid-sixties, he got right back to work, they said. Their father lived on Suydam Street around the corner from Circo's Pastry Shop and started working at the shop right away. After five years, he bought it from Sebastiano Circo, who'd owned it since 1945. In the years since the business has been in the family, they've had to adapt to the needs of the changing community around them to stay afloat. As the Italian population in the neighborhood dwindled the Pierdipino's found that their bulk sales of cookies by the pound were also on decline — those had been big sellers for people who'd offer them at gatherings with in-laws and relatives each weekend. Instead they put more of an emphasis on sheet cakes, they said. They found sheet cakes were much more popular among Latino families moving into the neighborhood who'd order them for birthday and wedding celebrations held in catering halls where you had to bring your own food. And over the years they've come up with new items to reach different clients — like the family-sized cannoli that their father created, a foot-long cannoli stuffed with dozens of smaller cannolis. While new items help attract different clientele, both brothers agreed, sticking to their roots is of utmost importance, just as being able to reach emigrant Italians has been critical to their survival. Online sales have allowed them to do that, and they now ship anywhere in the country. After all these years, both brothers are still committed to carrying on their father's business on Knickerbocker Avenue for years to come, they said. "[It's been] my father's place for so many years. You don't want to see it fold and go under. You want to fight to keep it going," Salvatore said. "It's what we know."